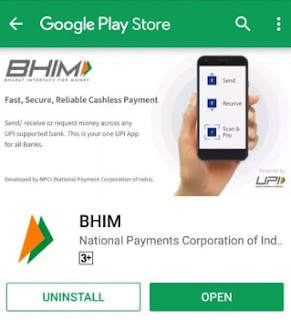 How To Install BHIM APP & Send, Transfer, Receive Money in BHIM (Bharat Interface for Money) UPI APP? How to Download BHIM App in Android Mobile Phone? Just follow this simple steps to download BHIM. In your android mobile phone open "Playstore"
after that you can use it with your aadhar card. How to Download BHIM App in Iphone 4, 4s, 5, 5s, 6, 6s,7, 7+? In your Apple Iphone open "APPstore"
after that you can use it with your aadhar card by verifiying that with OTP. Can I check Bank balance instantly? Yeas you can check your bank balance with in a minute by logining to bhim app in your smartphone. What is the Charges of BHIM App? There is no charges for transactions through bhim app in android / ios mobile phones. WHich Bank are supported with New Bhim APP? How To Install BHIM (Bharat Interface for Money) APP & Send, Transfer, Receive Money in BHIM UPI APP In Telugu Language?